Dhaka, 3 Feb, Abnews: The world’s fastest land animal, the cheetah, is a successful hunter not only because it is quick, but also because it can hold an incredibly still gaze while pursuing prey. For the first time, researchers have investigated the cheetah’s extraordinary sensory abilities by analyzing the speedy animal’s inner ear, an organ that is essential for maintaining body balance and adapting head posture during movement in most vertebrates. The study, published today in the journal Scientific Reports and led by researchers at the American Museum of Natural History, finds that the inner ear of modern cheetahs is unique and likely evolved relatively recently. In the inner ear of vertebrates, the balance system consists of three semicircular canals that contain fluid and sensory hair cells that detect movement of the head. Each of the semicircular canals is positioned at a different angle and is especially sensitive to different movements: up and down, side-to-side, and tilting from one side to the other. The researchers used high-resolution X-ray computed tomography (CT) at the Museum’s Microscopy and Imaging Facility, the National Museum of Natural History in Paris, and the Biomaterials Science Center of the University of Basel in Switzerland to scan the skulls of 21 felid specimens, including seven modern cheetahs (Acinonyx jubatus) from distinct populations, a closely related extinct cheetah (Acinonyx pardinensis) that lived in the Pleistocene between about 2.6 million and 126,000 years ago, and more than a dozen other living felid species. With those data, they created detailed 3-D virtual images of each species’ inner ear shape and dimensions. They found that the inner ears of living cheetahs differ markedly from those of all other felids alive today, with a greater overall volume of the vestibular system and longer anterior and posterior semicircular canals. “This distinctive inner ear anatomy reflects enhanced sensitivity and more rapid responses to head motions, explaining the cheetah’s extraordinary ability to maintain visual stability and to keep their gaze locked in on prey even during incredibly high-speed hunting,” said coauthor John Flynn, the Frick Curator of Fossil Mammals in the Museum’s Division of Paleontology. 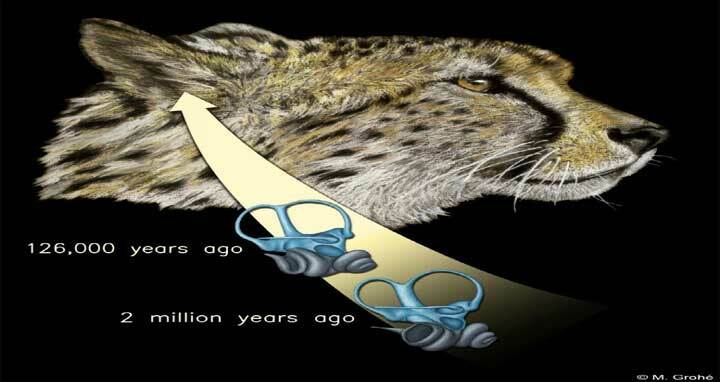 These traits were not present in Acinonyx pardinensis, the extinct species examined by the researchers, emphasizing the recent evolution of the highly specialized inner ear of modern cheetah.